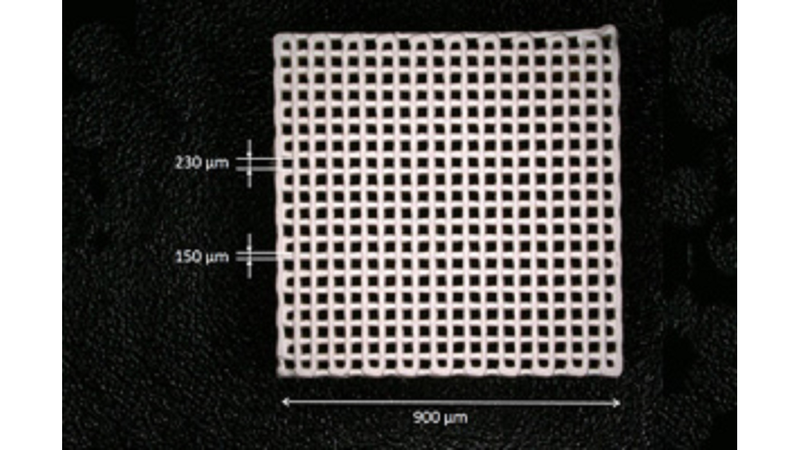 Ceramic pastes and a special drying method enable 3D printing. Filters with the finest pores are especially needed in filtration processes. Ceramic materials are particularly suitable for manufacturing these filters because they are resistant to high temperatures and chemicals. In the manufacturing of ceramic bodies, the ceramic materials or foams are shaped by pressing or casting. So far, however, only simple geometries with closed pore structures can be produced. During subsequent drying or sintering, defects often occur due to warps, as the green body adheres to the substrate. Scientists at KIT have developed novel ceramic pastes based on capillary suspensions whose characteristics are optimally adapted to the direct ink writing process. The ceramic paste is applied layer by layer with a movable nozzle and forms the green body. During pressing through the fine nozzle, the particle network of the capillary suspension is completely disrupted and the paste becomes thin. However, the special composition of the suspension ensures that the particle network is rebuilt immediately after leaving the nozzle, resulting in a high degree of shape accuracy of the printed structures. In order to prevent cracks or deformations during drying, printing is carried out on a PEG-coated glass plate, which is then wetted with distilled water and dried in the oven, including the green body. The PEG layer solvated by the water melts and allows the specimen to slide smoothly on the substrate. The invention enables the manufacture of complex ceramic bodies with high porosity and high mechanical strength. Due to the special properties of the paste, ceramic structures with very fine strut or lines of > 50 micrometers can be realized. The printed struts are open-pored (porosity > 50 percent) and the pore size can be set between 0.5 and 50 micrometers.